Map of the Rio de la Plata Basin, showing the Bermejo River joining the Paraguay River north of Resistencia. 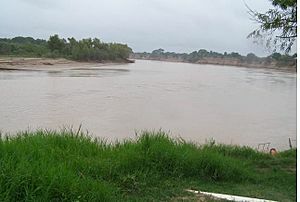 The Bermejo seen from Puente Lavalle upstream. 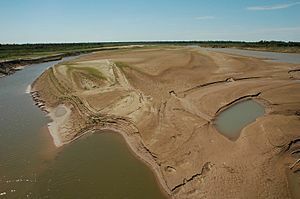 The Bermejo River is a river in South America. 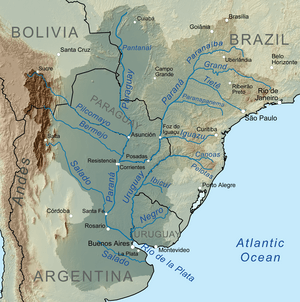 It flows from Bolivia to the Paraguay River in Argentina. The river is 1,060 kilometres (660 mi) long. The Bermejo is not able to be travelled on. Bermejo River Facts for Kids. Kiddle Encyclopedia.